I'm back! I'll remember 2018 for finishing two enormous projects: The revision of the Colorado Academic Standards (where I had a hand in all 12 content areas, not just mathematics) and the completion of my dissertation and my Ph.D. It really became necessary to set aside this blog (and a whole lot of other things) to get those done. When 2019 is over, I hope to remember it as the year life resumed some sense of normalcy. I'm going to make some tweaks to my previous TWiME format. Most notably, I'm not going to apply more editorial discretion instead of simply resharing whatever happened to be the most popular link on Twitter each day. Sometimes what is popular isn't what's best, and what we see on the internet is already controlled by enough half-baked algorithms without me, a human, trying to act like a half-baked algorithm myself. If you want raw data about what's popular, you can look the same place I look, my Nuzzel feed for my MathEd Twitter list. I think I'll also allow myself more flexibility week-to-week instead of thinking I need a certain amount of research, news, events, etc. in each post. With that said, let's get on to it, shall we? As a preservice teacher, my advisor, Bonnie Litwiller, told us to read decimal numbers properly, i.e., read "5.43" as "five and forty-three hundredths." I'm a stickler about a lot of mathematical language, but I wasn't sold on this one. Sara Van Der Werf's post, "Small Change, Big Difference part 1. Why you should eliminate ‘POINT’ from your vocabulary" made me rethink my position about this because it makes such a compelling argument for how our language helps students build their understanding of place value and the base-10 number system. George Woodbury read a lot of books last year and summarized the best in the post "Top 5 Education Books I Read Last Year". George seems to like reading about student learning and most of the books on this list were new to me. Kyle Pearce and Jon Orr have a podcast? When did this start? Less than a month ago, it turns out, so if you're just finding out now, like me, you haven't missed very much. It's called "Making Math Moments that Matter" and the first few episodes have focused on curiousity, sensemaking, and mentoring. On Tuesday, January 8, Sara Vaughn, Martin Joyce, Morgan Stipe, and Jen Arberg will lead the Global Math Department with a discussion of their experiences with the Open Up Resources 6-8 math curriculum. Dr. Robert Berry, President of NCTM, will hold a President's Message webinar on Wednesday, January 9 at 7pm EST. Register now to attend. 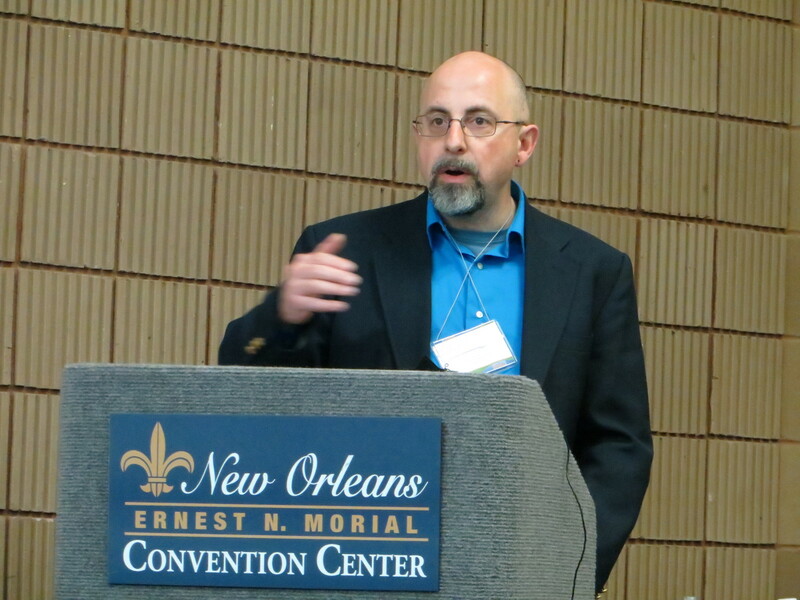 While you're at it, check out NCTM's webinar archives to see what else you might have missed. The first #TCMchat of 2019 will be Wednesday, January 9 at 9pm EST. The topic will be the article "'Sliding' into an Equitable Lesson" by Kelley Buchheister, Christa Jackson, and Cynthia Taylor. 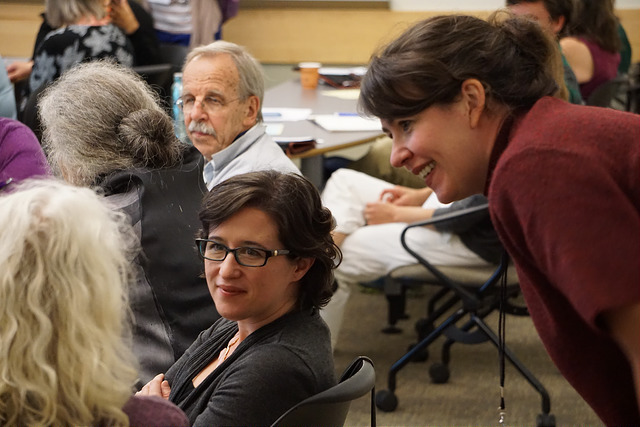 The application deadline for the Teacher Leadership Program at the IAS/Park City Mathematics Institute (PCMI) is Tuesday, January 15. This is a professional development program best suited for teachers of grades 5-12. Teachers of lower grades may apply but should be aware of the emphasis on mathematics in the program. Applicants to TLP must spend at least 50% of their time as classroom teachers. You'll need a resume and reference letters, so don't put off your application until the last minute! 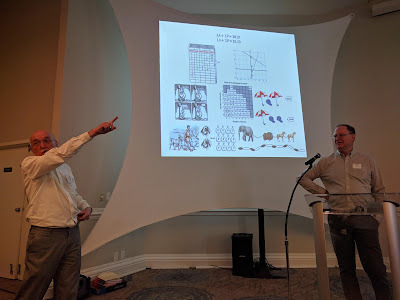 To learn more, you can go to the website and you may want to review this Global Math Department session from last month. The PAEMST application cycle is open! Outstanding grade 7-12 teachers of mathematics, science, computer science, technology, and engineering can be nominated any time before March 1, 2019. Those teachers accepting their nomination have until May 1, 2019 to submit a completed application. Are you interested in becoming a reviewer for EdReports.org? If so, you can apply now on their website. Celebrate Teacher Appreciation Day with the Buffs and a basketball game on Thursday, January 10th! CU Boulder alums and friends of the School of Education are invited to a pre-game reception and can get discounted tickets to the basketball game. Math on the "Planes" is coming February 22-23! This year's facilitator is Steve Leinwand and the event will be held in Adams 12. You can register on the CCLD website and those needing a scholarship to cover registration costs are encouraged to apply through the Mikkelson Mathematics and Science Scholarship Fund. The deadline for scholarship applications is January 18, 2019. I might move some things around, but this one-feature-weekly in addition to the Math Ed Said review of Twitter activity seems like a good idea. January 26: James Tanton wrote a wonderful piece on Medium, "Just teach my kid the <explitive> math." I'd guess most math educators have found themselves in these kinds of conversations (even within one's head) and Tanton's version is one of the more articulate versions I've seen. January 27: Other people must agree with my enjoyment of Tanton's article because more decided to share it on the 27th. Here it is, again: "Just teach my kid the <explitive> math." January 28: How fun! Here in "Equations I Have Known" Joe Schwartz cataloged a number of the ways students use the notation for operations and equality before they've attended to the level of precision we expect from someone who has mastered these conventions. Some are quite common, like run-on equations (1x2=2-1=1), but others might be new to you. January 29: As a first-year teacher resisting the mid-'90s feel-good, self-esteem pushes in education, I was convinced that my students (before I'd even had a chance to teach them!) would feel good about math if they were successful at it, and not the other way around. I gradually learned that it wasn't that simple, and new research from Stanford is helping us better understand how a positive attitude toward math predicts math achievement in kids. January 30: More people shared the story, "Positive attitude toward math predicts math achievement in kids." January 31: I so appreciate David Bressoud's relentlessness when it comes to calculus education reform. Here he is on The Conversation with "Why colleges must change how they teach calculus." Part of this article talks about the SEMINAL project, which my advisor David Webb works on as part of his role at CU Boulder and on behalf of the Association of Public Land Grand Universities. February 1: More people helped spread the word about the Desmos Teaching Fellowship. ESM published both their January and February issues since my last Research Report on January 5. This issue focuses on mathematics learning and computational thinking. Both the January and February issues of IJSME have been published since the last Research Report. January 19: If you missed it earlier, here again is Graham Fletcher's Fraction Video Series. 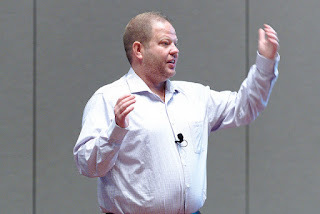 January 20: Robert Kaplinsky did us all a favor and reminded us that a great resource is the Formative Assessment Lessons from the Mathematics Assessment Resource Service (MARS). My recommendation: Do not underestimate how much thought went into these, and be willing to trust them even if you're accustomed to making a lot of adaptations to your usual off-the-shelf lessons. January 21: To show support for Laurie Rubel, the American Association of University Professors are collecting names of people who wish to stand with Laurie. January 22: With a second contribution to this post in three days, this time of his own design, Robert Kaplinsky shared his Depth of Knowledge Matrix for Secondary Math. January 23: Steve Wyborney's "Cube Conversations" is back on this list again after an appearance the first week of the year. I think of these as doing something geometrically to prompt math discourse similar to how arithmetic problems prompt math discourse in number talks. January 24: Lots of people shared and reshared the announcement of the Desmos Teaching Fellowship. January 25: More people shared the Desmos Teaching Fellowship announcement. There are dwindling number of openings remaining for Math on the "Planes", the two-day math conference hosted by the Colorado Council for Learning Disabilities. The conference will be held February 23-24 in Centennial and will feature Dr. Barbara Dougherty. Register today! 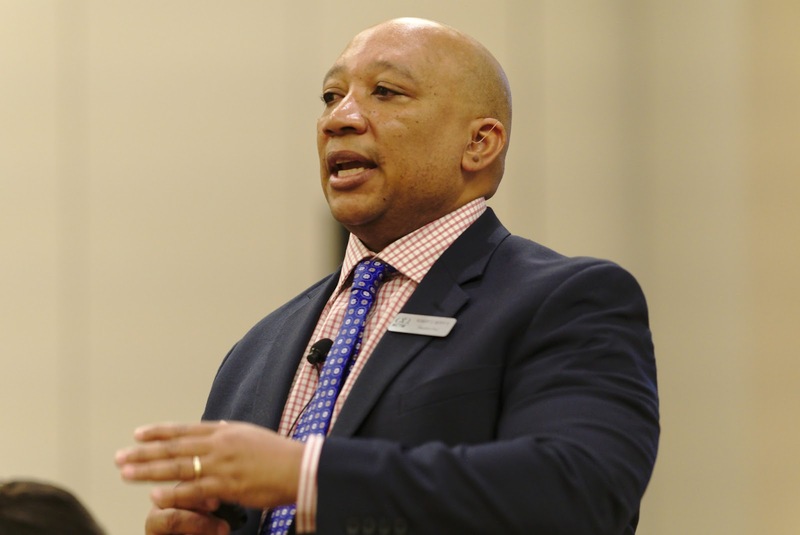 Texas Instruments is hosting a one-day Leadership Summit in Denver on March 22. The title of the summit is "The Leader's Role Implementing STEM and Computer Science Initatives" and the keynote speaker is Peter McLaren, past-president of the Council of State Science Supervisors. Other speakers include Dr. Joanna Bruno of CDE, who will discuss science and computer science in Colorado; Gwen Perea Warniment, who will talk about designing K-12 STEM initatives, and CCTM President Joanie Funderburk, who will focus on mathematics education. If you're thinking about attending the MidSchoolMath National Conference in Santa Fe, NM, their standard registration deadline is Friday, February 2. The conference features Jo Boaler, Dan Meyer, and Tracy Johnston Zaeger. Woodland Park is seeking someone to teach Algebra 1 and Algebra 2 beginning February 12. More information can be found at www.wpsdk12.org. 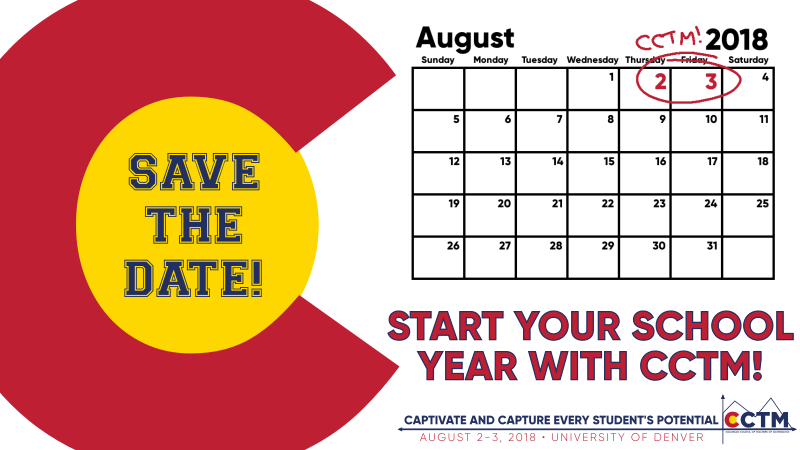 The 2018 CCTM Annual Conference will be August 2-3 at the University of Denver. By moving the conference to just before the start of school, you can worry less about your sub plans (and your district won't have sub costs) and you can focus your attention on connecting with your Colorado peers in two days of great math teaching and learning. CCTM is accepting nominations for five positions on its Board of Directors: President-Elect, Vice President, Secretary, and Regional Representatives for Regions 2 and 5. Nominations close on February 2. CCTM is also accepting nominations for its teaching and leadership awards. Awardees receive a plaque, one year of CCTM membership, complimentary registration to the CCTM Annual Conference, and a $200 award. The next meeting of the Colorado Math Leaders will be held at the Instructional Support Facility at 5416 S. Riveria Way in Centennial from 10:00 to 2:00 on Wednesday, February 21. (Note: This is a recent change in location!) If you aren't on the CML mailing list and would like to be, send me an email. CSEd: Districts have until February 28 to apply for the Computer Science Education grant and receive up to $10,000 for their district to spend on professional development, tuition, books, or other programs and resources to directly support the teaching of computer science in Colorado. Details about the grant and other computer science opportunities can be found on the CDE website. Lemelson-MIT: If you want to learn more about the $10,000 Lemelson-MIT STEM grants, there is a webinar on Tuesday, February 6 from 4:30-5:30 MT. More information about the program can be found on the Lemelson-MIT website. The Teaching and Learning Conditions in Colorado (TLCC) survey (formerly TELL Colorado) is a key tool to help CDE and other education stakeholders understand the conditions of education around Colorado. The survey should take less than 15 minutes and it closes February 23. Schools and districts that reach the 50 percent participation threshold (and at least five respondents) will be able to access their own data after the survey window closes. This is valuable data that can lead to very rich discussions about improvements for your school and/or district. You may be interested in a class being offered through CEA's COpilot platform that focuses on co-teaching relationships between a general education teacher and a teacher who supports students with disabilities, language learning, or other students from special populations. This class is designed to be taken by both teachers in the relationship. For more information, see the COpilot website. January 12: I think this is the second time I have seen this Desmos graph of the spinning Desmos logo appear as the most-shared thing on Twitter. I don't get it. January 13: Laurie Rubel of Brooklyn College got some media attention (and unwanted negative attention from readers of some of those sites) about a story discussing her article, "Equity-Directed Instructional Practices: Beyond the Dominant Perspective" in the Journal of Urban Mathematics Education. As usual, most of the criticism/harassment came from people who didn't read the article, even though it's available via open access. January 14: If you haven't seen SolveMe Mobiles, you should really check them out. These are good examples of how algebra doesn't always have to look like variables and equations, and that students can figure these out as puzzles well before they're in 8th or 9th grade. January 15: The original link to this was broken, but I'm pretty sure people were trying to share "Minimizing the 'Matthew Effect'," a blog post by Mark Chubb. By the "Matthew Effect," Mark describes that phenomenon where children who start off a little bit ahead of others get offered more opportunities to engage (in sports, or math, or whatever) and that extra engagement gives them compounding advantages over time — and maybe we should consider that as teachers when structuring participation in the classroom. Kara Imm leaning in during the 2015 RME Conference. January 16: First of all, if you're into number talks and haven't been to the Number Strings website, you need to be there like yesterday. Second, take your time and read "Trusting the digits: Developing place value understanding." Are conversations among students happening like this in your classroom? Although unstated, Kara Imm gets the author credit for this post — I recognized her masterful facilitation! January 17: The American Association of University Professors collected names of those wanting to Stand With Dr. Laurie Rubel at Brooklyn College. January 18: Graham Fletcher put together a Fraction Video Series called "The Foundation of Fractions." The videos are presented with teachers as the audience, such as teachers who want to improve the way they teach fractions or the way they want to understand fractions themselves.